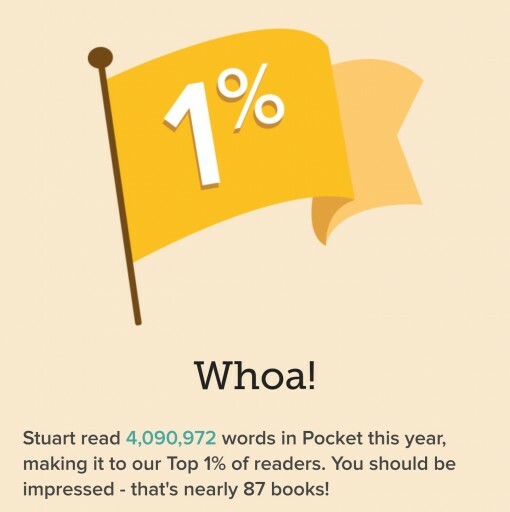 With more than four million words read on Pocket, this is the second year I’ve been honored with the 1% designation. Congratulations! You made it to this year’s Top 1% of readers on Pocket! Needless to say, we’re impressed, and to celebrate we’ve put together your own personalized Year in Pocket to share and reflect on. And those four million words do not account for all the other online sites I peruse daily not to mention all the comic books, magazines, newspapers, instruction manuals, take out menus, and street signs that I read offline. In the top one percent. That’s nice but I wonder how my 4,092,972 words (nearly 87 books) I’ve read compares to more-traditional readers, both casual and bookworms. Behind on news? Use IFTTT for auto-curated content WTF? How did I collect 5GB of articles on my Pocket?